Testing plays a critical role in the development of your web site and its long-term maintenance. While smaller web sites – especially those with more limited budgets – may not need to follow the formal testing procedures that are required for large-scale, commercial web sites, every site needs to be thoroughly tested to ensure that it’s error-free, user-friendly, accessible, and standards compliant. Testing should be completed during each phase of a site’s development. Two of the most costly web project mistakes are to delay testing until just before launch, or not to test at all. Testing during production makes it easier to locate and resolve errors, and minimizes the chance of existing bugs being replicated throughout later stages of development. Early and continued testing can eliminate the need for the costly redesigns and other major fixes that can result from overlooked errors. This chapter’s checklists, extracted from SitePoint’s new release, Deliver First Class Web Sites: 101 Essential Checklists, will help you test your site both during development, and after. Download this checklist, along with others covering SEO and content management — you’ll also receive .pdf versions of the documents for immediate use in your web projects. Document your baseline web site testing requirements. Make use of the preliminary data you collected in Chapter 2 to help determine and document your baseline site testing requirements. For instance, the information you collected on the browsers and connection speeds that your visitors will use, and those visitors’ skills and age groups, can be used as a basis for your testing plan. Source and install all necessary tools. You can conduct tests very cheaply using free and low-cost testing tools. Most browsers are free or offer conditionally free versions, and you can download and install multiple browsers – including several versions of Internet Explorer for Windows – on one computer. Alternative device simulators and emulators, such as those for cell phones and PDAs, can also be downloaded and used for free, and most shareware and commercial software creators allow a 30-day trial of their products for testing purposes. Some web design-related discussion lists, as well as the SitePoint Forums, welcome testing requests and posts that solicit bug reports and feedback. One of the difficulties associated with testing design elements on different platforms is that the test results can be subjective. For example, a designer may create a CSS-driven site that works perfectly on newer browsers, but doesn’t look that hot in older browsers such as Netscape 4. The tester may interpret this as a failure point rather than acceptable "design degradation." To avoid the time and effort involved in re-submitting pages for testing, spell out acceptable cross-browser, cross-platform differences in advance – including protocols for supporting old browsers. Set up a staging server. A staging or test server that’s identical to your web site’s live server environment should be used for testing and development purposes prior to your site’s launch. Track bugs and confirm fixes. Regression test, especially when fixing bugs. Regression testing, which is also known as verification testing, is the process of retesting pages or sections of a site to make sure that a recent bug fix hasn’t broken some other aspect of the site, or reinstated bugs that were fixed previously. Conducting and documenting regression tests will allow you to identify any parts of the site that break, and document the causes of those errors and how you resolved them. If a bug resurfaces at some point, it will be spotted immediately and resolved quickly. (See Regression Testing, Webopedia Computer Dictionary). Validate the markup for each individual web page. Validate the markup for all your web pages to ensure that each uses structural, compliant markup. This will allow you to confirm that you’ve used the correct markup for the specified DOCTYPE, fix any typos you may have made, and resolve any syntax errors. Validating your markup as you build a page, rather than waiting until you’ve created an entire page (or worse, an entire web site), makes it easier to isolate, find, and correct markup problems. Some HTML editors integrate validation tools such as W3C’s HTML and CSS validators, the WDG HTML Validator, and the CSE HTML Validator (an HTML/XHTML syntax checker and validator), which allow you to validate your markup conveniently while you work. The CSE and WDG HTML Validators also include helpful batch processing features. So, for example, although I validate each page with the CSE HTML Validator and the W3C’s validators as I work, I use CSE HTML Validator’s batch processing to recheck multiple pages simultaneously. I also use batch processing as a final check when I’ve finished developing all the pages of the site. Conduct load testing to stress-test programming technologies and server hardware capacities. You need to make sure that the programming technologies you’ve used, and the capacities of your server hardware, can cater to higher levels of traffic than you expect the site to receive. Taking this approach will help you ensure that your site remains online and fully functional at all times. Load testing procedures should include a trial run – tests that usually involve the use of automated scripts that emulate multiple simultaneous user sessions. The trial run will reveal how the programming technologies and server hardware you’ve used will cope with traffic spikes. Your ISP should match your hosting package with your projected server loads if you’re using a web hosting service, so you should let them know what your loads will be. Your web host might recommend a different web hosting package that offers greater capacity if your load testing reveals that your existing setup has the potential for problems as traffic levels increase. Test your web site on multiple browsers and platforms. The fact that your web site looks good and works well in one browser doesn’t mean it will look as good or function as well on other browsers and/or platforms. Even if you’re developing an intranet web site for an organization whose employees use the same browser and operating system, the hardware and software used by those employees can and will vary. In the long run, it’s better to develop your web site on the basis of the W3C recommendations, then to follow up with extensive cross-browser, cross-platform testing. Stay informed of the release of new or updated browsers and operating systems so that you can keep your cross-browser, cross-platform tests current. Check your server logs – as well as other on- and offline resources – that cover browser statistics, operating systems, and emerging Web use trends, so that you know which browsers, versions, and operating systems your web site visitors use now, and are likely to use in future. As part of your approach to site maintenance in the long term, plan to check your server logs weekly (monthly checks might be fine if you run a smaller web site with low traffic volumes) to follow changes and trends in your browser statistics. Take this data into account as your hone you your cross-browser, cross-platform testing procedures, to ensure that you’re testing all of the browsers and operating systems that your visitors use. Here’s a list of the popular operating systems and browsers on which you might test your site. Test page optimization with every update. Optimizing your pages right from the start can help ensure that your site design and images support fast page load times, and that the site’s development is smooth and efficient. Whenever you add anything to your web site – new content, new images, or new web pages – check that content’s optimization to help keep the site streamlined. If you’re not yet familiar with web site optimization, see Chapter 11, Web Site Optimization. Some HTML editors include features that tell you a document’s weight, or a page’s load time at various connection speeds, and most image editing software products indicate file size load times at various connection speeds. There are also free online tools that calculate document weight, composition, and page load times, and even offer recommendations for optimizing web documents. Siteoptimization.com’s helpful Web Page Analyzer is one such tool. View pages on a variety of displays. You may find that your beautiful design, which is wonderfully contrasted on an LCD monitor, is impossible to read on a CRT monitor, and completely unusable on alternative devices. Different displays will not always interpret your site’s design and colors consistently, so it’s worth testing your initial design, as well as the site’s ongoing development, in a variety of displays. View pages on different screen resolutions and with various color settings. Screen display sizes may or may not reflect the actual dimensions of the viewable web page. Many users don’t expand browser windows to fill the entire screen (especially on larger monitors), and various toolbars and side panels can take up portions of the screen width and height. For example, on an 800×600 display, a browser that has a side panel and a couple of custom toolbars across its top would display only 500×400 pixels of a web page – less if the browser window isn’t maximized. Be sure to conduct testing that accounts for this wide range of variability – not just the standard maximum screen resolutions. Table 14.1, which shows screen resolutions of various devices, and Table 14.2, which shows the color depth settings of different displays, should help your testing. In addition to the displays mentioned in Table 14.1 and Table 14.2, there are standalone tools – such as BrowserCam, an online subscription service – which provide screenshots depicting the way your content will appear in a wide range of screen resolutions and browsers. Check for adequate color contrast. A good way to check color contrast is to change your browser display to grayscale, or print the web page in black and white. A tool that can be very helpful for checking your design’s color contrasts is Vischeck, which simulates colorblind vision, allowing you to see your pages as a colorblind user might. Test the functionality of external and embedded scripts and functions. Some scripts and functions might work fine in one browser, though they may not work correctly, if at all, in other browsers or devices. Minor tweaking can resolve many cross-browser, cross-platform functionality issues. If older browsers or alternative and adaptive technologies don’t support some functions, you may wish to provide alternative methods to allow those users to access those capabilities some other way. Test all links, including navigation. Ensure that all links work properly, and point to the correct location. Link checking software can check for valid, broken, and redirected links. Some HTML editors, such as Macromedia Dreamweaver and HomeSite, offer link checking capabilities. Free tools are also available – try Xenu’s LinkSleuth and W3C Link Checker. See WebsiteTips.com’s section, "Link Checkers, Maintenance" for more. Note, though, that link checkers aren’t intuitive enough to check whether links direct to the correct location – be sure to check for this manually. Intentionally enter incorrect URLs into the browser’s address bar to check that the appropriate error pages (404 errors, etc.) are in place. Check that digital certificates and SSL URLs work correctly. Check that all pages requiring SSL access are accessible only via SSL. Test the security of restricted areas. Users might share or try to guess the URLs of content and downloads in protected areas of your site. Restricted content URLs might appear within publicly available referrer logs. People might even share usernames and passwords without authorization or permission. As such, it’s critical that you anticipate the kinds of security breaches that might take place, and test methods for their prevention. Ensuring security and data integrity – especially in terms of your confidential data, including customer credit card information – is critical for promoting and maintaining trust among your site’s visitors. Don’t assume that your web site’s security is always okay. Test regularly to make sure it remains secure. Test forms and form controls. Check to ensure that forms are submitted correctly, and that they’re only submitted when the correct information is entered and required fields have been completed. Review form error messages to ensure that they are helpful and informative within the context of the form itself. If you plan to make your site accessible, and include accessibility testing in every phase of your project, chances are good that by the time your site is ready to launch, it will meet the W3C’s WCAG Guidelines, as well as any other accessibility guidelines that it must address. The W3C recommends a two-phase process for testing a site’s accessibility. First, developers should conduct a preliminary review of the site that includes testing a few pages to get an idea of the site’s accessibility. Then, they should undertake a thorough, comprehensive review that includes an evaluation of every web page (or representative pages on larger web sites) with a variety of tools and users who have disabilities. (W3C, Evaluating Web Sites for Accessibility, W3C Web Accessibility Initiative (November 14, 2002).) The checklist below is a guide for conducting a preliminary accessibility review. Select a random sampling of pages to test. Use a graphical browser to test sample pages. Use a voice or text-only browser to test sample pages. 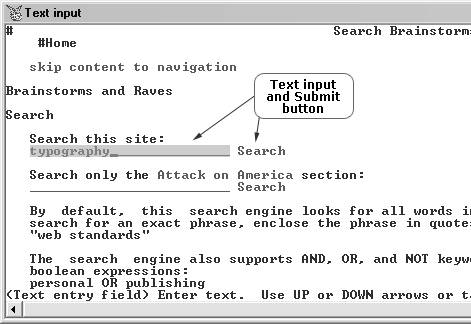 A text-only browser, such as the free Lynx text-only browser, can provide valuable insight into your web site’s accessibility. Table 14.1 and Table 14.2 list tools that you could use to evaluate your site. A comprehensive review is much more thorough and detailed than a preliminary review. Here’s a checklist that will help you ensure you don’t miss a thing! Identify, determine, and document site-wide conformance requirements and levels. Test the site’s accessibility conformance. Use at least two different accessibility evaluation tools. Use a text-only browser and a voice browser to test pages. Ensure that interface elements are operable with multiple input devices. Read over each page of the site to check that all the text is clear, simple, and appropriate for your web site’s target audience, as well as those segments of the market that have cognitive or learning disabilities. Clear Language and Design (CLAD) offer a great Reading Effectiveness Tool that’s designed to assess the literacy skills that users will require in order to understand your text. For helpful insight on cognitive and learning disabilities, see Roger Hudson, Russ Weakley and Peter Firminger’s article, An Accessibility Frontier: Cognitive Disabilities and Learning Difficulties. Conduct usability testing with a diversity of participants. There’s no better way to assess your site’s accessibility than to have disabled users test the site. It should be noted, for example, that a sighted person will not use a screen reader, such as JAWS, in the same way as a blind person who uses the tool daily. There are also helpful accessibility testing extensions, sidebar panels, and toolbars for other graphical browsers, including Mozilla, Firefox, and Internet Explorer. As well as visiting your favorite browser’s web site, see Derek Featherstone’s Testing Tools for Developing Accessible Web Sites – a helpful list of annotated browser links. As long as you’ve included the <alt> attribute for each image (for use by browsers that don’t support images, or visitors who are browsing with images turned off), the browser will hide decorative images that have blank <alt> attributes. However, if you don’t include <alt> attributes, browsers will not hide the images, and screen readers will read the word "Image," as indicated in Figure 14.2. View pages without style sheets. Check that your pages allow users to vary the font sizes displayed. View tabular data with tables disabled or in a browser that doesn’t offer table support. View the web site with new technologies turned off. Check that web site navigation is available and works properly. If your web site uses images – including image maps – for navigation purposes, text hyperlinks should appear in their places (via <alt> attribute text, and possibly also in the <title> attribute text, if needed). If you use Flash or Java applets for navigation, your site should include alternative text navigation links to help ensure accessibility. Keep in mind that this approach also helps search engine bots to crawl and index your web site. For more on optimizing your web site for search engine crawlers, see Chapter 11, Web Site Optimization. Check that decorative images don’t appear in text-only browsers and aren’t read by voice browsers. As we discussed above, all decorative images, such as bullets and design-related images, should have blank <alt> attributes so that text-only browsers and voice browsers ignore them. Check that the information is presented in a way that’s comprehensible when read serially. Figure 14.3 depicts the testing of an accessibility-friendly form with Lynx 2.85. If you find yourself short on money, time, or both, you might be tempted to consider skipping the usability testing phase. Rather than skipping this process altogether, it’s far better to test on an abbreviated, informal scale. It’s better to conduct a number of small, fast tests during development, rather than one big test at the end – especially if that final usability test is to be scheduled just before the site’s launch. List test objectives and concerns. Be specific, making note of tasks and areas of the web site that might be of concern – for instance, forms that might be difficult to complete or use, or the methods by which users are expected to find certain products. Be sure to specify these age groups and computer skill levels that you wish to test. Numerous approaches have been developed to testing various aspects of sites’ usability. In planning your usability tests, it’s important that you research and consider the available approaches in light of the resources and time you have available. For example, you may choose to use personas or card sorting to help test your web site’s information architecture – one single, but critical aspect of your site’s usability. By creating personas, you can document the steps typical visitors would take to accomplish particular objectives, then test those steps – looking specifically at the information architecture, navigation, and forms, for example, that that persona might use to achieve that goal. To conduct a card sorting test, give users index cards on which are written the titles of pieces of content, features, or categories. Include brief descriptions on each card, but don’t hint at any information structure or classification. If you plan to add more content to your web site in future phases, it can help to add those specific elements to the cards if you can. Be sure to brief your test users, explaining that there are no right or wrong answers. Ask them to read each card carefully and group them into piles that make sense to them. If the users aren’t sure about a card, they can set it aside and come back to it whenever they wish. When they finish, ask them to label each pile. Compare the results with your web site’s information architecture as one way to determine whether or not further tweaks or changes are required. Recruit users for testing based on your target market. Test users should represent your target audience profiles. For example, if your typical users aren’t very technology-savvy, but you test with technology-savvy users, your test results won’t uncover potential technology-related problems, such as confusion with drop-down menus or multiple browser windows. A test group of five users is considered large enough to provide information that will help improve your site’s usability. Prepare an NDA (non-disclosure agreement) ready for users to sign prior to starting your tests. For more on testing approaches, see Janice Fraser’s The Culture of Usability: How to Spend Less and Get More from Your Usability-Testing Program, and Lane Becker’s 90% of All Usability Testing is Useless. Create a relaxed atmosphere for testers. Rather than making people think they’re in a lab being assessed, decorate your test area as if it were a typical office setting or perhaps a living room. The SitePoint article, Why You Don’t Need a Usability Lab, has more on this. Establish realistic tasks for users to perform and identify what, specifically, you will measure. Provide simple, clear instructions only. Allow users to perform their own tasks in addition to your pre-defined tasks. Using a ranking system with areas for comments gives you valuable data. You can analyze the ranked responses, and use the comments and explanations for further helpful insight. You may decide that it is necessary to meet with your entire web site project team following each testing session to discuss what worked, what didn’t, and what the possible solutions may be. This chapter emphasized the importance of checking your work and testing the site throughout every phase of its development and long-term maintenance. There were checklists to help you test your designs, content, and markup; procedures for cross-browser, cross-platform testing; and discussions on testing labels, functionality, security, accessibility, and usability. You can download this chapter of Deliver First Class Web Sites: 101 Essential Checklists, along with all the SEO checklists in .pdf format, ready for use with your next project. To find out more about the book, check out the Table of Contents. Shirley Kaiser owns SKDesigns, a company focused on creating visually appealing web sites that are based on web standards and universal accessibility, and are optimized for speed and search engines. Aside from her web work, Shirley is a professional musician with Bachelor of Arts (B.A.) and Master of Arts (M.A.) degrees in Piano Performance.